Ice Cream and other important life lessons | go do. You can get this cute print on Etsy. I love ice cream! 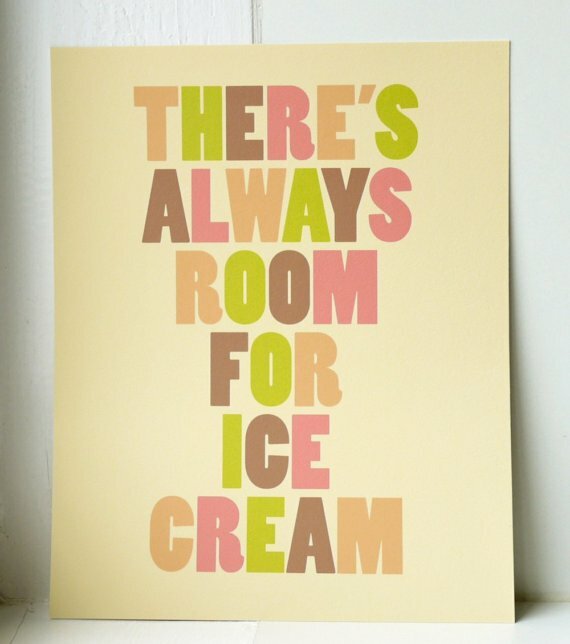 And oh yes, there’s always room for ice cream. (My dad says this all the time so you could say I learned this one pretty early.) I enjoy ice cream on a lazy summer day in the garden, but wouldn’t say no to an ice cream dessert in winter. Some days ago I asked D if we can have ice cream – his response: “We didn’t even have lunch!” He obviously was missing the point . - do more of what makes you happy. - a cup of tea solves everything. - be happy, it drives people crazy. - when all else fails, take a nap. - go the extra mile, it’s never crowded. Have a look at all my current favorites on my pinterest board! Do you have any wise words to live by?